Here is a nice golf course review from a long time Thailand golfer and expatriate resident of Bangkok. I’m a bit old fashioned when it comes to golf. My 3 wood has a steel shaft, I use an Arnold Palmer blade putter, and I prefer to walk whenever feasible. I also really enjoy good traditional parkland style golf courses. I also like the modern designs and even some of the more unusual and flamboyant layouts, though it is the traditional parkland style layouts that I can play over and over again without ever tiring of. Navatanee Goff Course in Bangkok is just such a place. The kind of course that after you finish it, you can’t wait to come back. Designed by Robert Trent Jones Jr. in 1973 to host the 23rd World Cup of Golf in 1975 (won by a US Team which included Johnny Miller at the peak of his career), this course is pure Trent Jones. Big tree lined fairways – some even wider than many driving ranges! You won’t lose too many balls here while watching penalty strokes add up – in fact there is water on only six holes and ‘out of bounds’ isn’t much of a factor either (usually way, way left on the holes where there is OB). That doesn’t mean this track is easy though. From the tees it often doesn’t appear difficult, though numerous strategically placed fairway bunkers and limited but effective greenside bunkering force you to control shot placement. Wide tee shots can usually be found and played, but your only option might be to punch out of the woods or loop one high over the trees in hopes of setting up your next shot. Straight forward and uncomplicated, it could perhaps be called ‘classic parkland design done to perfection’. Compared to modern course construction, not much dirt was moved to create this beauty. It’s also a pretty damn good ‘walk in the park’ with large and healthy trees of many varieties, numerous flowering shrubs, birds, ducks, and of course those beautiful wide expanses of lush green fairways. All this nature further helps give Navatanee something Bangkok, like many metropolises, could use more of – clean air! Another ‘old fashioned’ element is that the fairways aren’t cramped by overbuilt housing developments – while there are some homes along the perimeter, they are far out of play and thanks to the trees almost out of sight. This is a course that consistently pleases all levels of players and you will enjoy your day here regardless of what your scorecard looks like. If the numbers are big, don’t worry because there is plenty of brew and wine in the clubhouse to ease your mind, best served with tasty selections from the large menus of Thai, Japanese and western style foods available (the Japanese menu is so large it actually comes as its own separate menu). Drawbacks?… well there are a few. The course has a large local membership and thus outside play is only permitted on non-holiday weekdays, and tee times are limited. And like many courses built during its era there is no driving range. Oh, and it ain’t cheap – actually it is one of the more expensive greens fees in town – but definitely worth a play at least once for any serious golfer. Try it – you’ll like it! 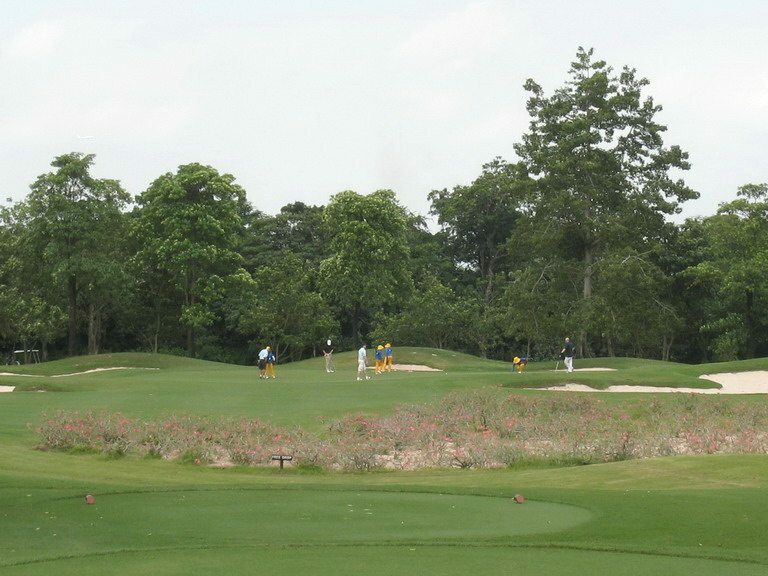 How about some more reviews from readers of this Thailand golf blog?